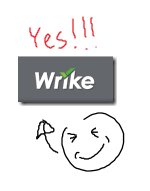 Wrike.com is an awesome, awesome project management tool. Blogging to pass on the love. Why is it awesome? Because it is light, makes no assumptions about my workflow, and is simple and intuitive. Consists of tasks, arranged in folders (one-to-many), with dependencies (Gantt charts), integrated with email allowing for easy discussions and notifications, and time tracking to boot. Currently, I use Wrike at JoMI along with FairSetup (my other project) allowing everyone on the team to, once a week, quickly review our activity and self-report on accomplishments/time allocation, which leads to short-cycle calibration within the team. Apparently MBO is all the rage in HR nowadays. I used to think that management is easy. About three years into JoVE turned out that… not so much. Now at FairSetup, learning what feels like a ridiculous about management… and the difference between good and bad management.Useful acronym – goals must be SMART. Seems like a simple, almost cliché, tactical description. But it’s amazing how often people fail at missing at least one item above, which leads to all sorts of idiotic problems.